I really know how to wait until the last possible moment don't I? 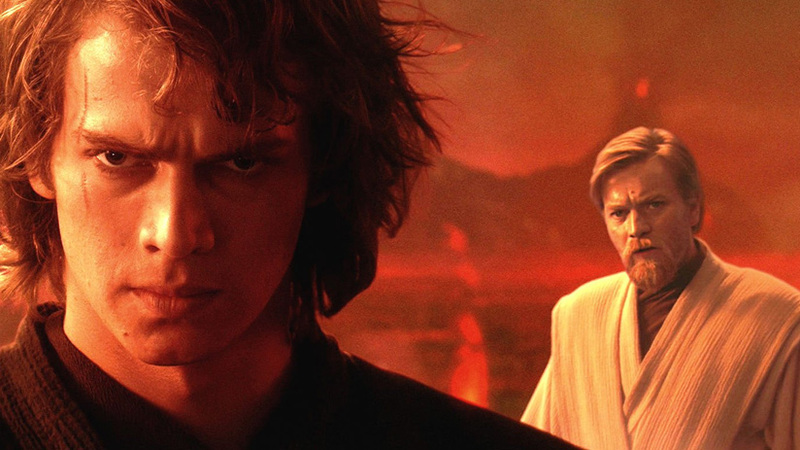 With a plan to watch every Star Wars movie on a monthly basis, of course I wait until the last day of the month to watch the final chapter of the prequel trilogy - Revenge of the Sith. And I'll probably never see it again. Even after watching these three movies, movies I had a hard time enjoying, I still consider myself a Star Wars fan. I'm still psyched for The Force Awakens, and really am looking forward to revisiting the original trilogy over the next three months. It's just these movies. I just don't care for them, and the biggest problem of all these movies is the actual protagonist of the entire trilogy! Okay, I should probably preface that by saying the biggest problem was George Lucas writing and directing these all himself. Big picture wise, he gives us a giant epic vision, but once he goes about telling the tale there are just moments that lose me. I had to rewind that a few times. Did he really say that? Like that? I'm watching this movie thinking, okay this General Grevious guy is pretty cool. But why is a robot coughing? Then later we get a zoom up of his eyes and I see that he's part lizard man or was a lizard man or something lizard like. Maybe this was a way of showing that the bad guys (Republic? Empire? I dunno) can take living things and make Robocops out of them? And who was this dude anyway? He's in this movie seemingly out of nowhere, but it felt like I should know him already. Then later he's given the Darth Maul treatment of "coolest new character in the movie that dies." Really though, most of my trouble still lies with Anakin. In the first movie the kid was - just a kid, but why were we supposed to root for the future Darth Vader? The second movie brought us a older/whinier, and maybe worse acting Anakin. This time he falls in love - I know this because we were told this. How this happened I'll never know. This time around, we get a...well I have to say his look was better, but whenever he opened his mouth I myself wanted to dive into that lava that almost killed him in the end. And as much as I dislike Hayden Christensen's performance, and as much as I looked forward to hearing James Earl Jones' voice again - I think I might have disliked Jones' few minutes even more. Oh wait, am I wrong? Did I actually like it? Okaaay, I guess he was doing his best whiny Hayden Christensen impression, maybe that explains why he talked like he did. Doesn't mean I have to like it. I'm starting to think the Jedi weren't all they were cracked up to be. Sure they're great warriors, but they really just let the Dark Side get the better of them pretty quickly. And how smart is it really to send Luke SKYWALKER to live with his own aunt and uncle and use the SKYWALKER name? How is that hiding him? Even with Obi-Wan looking over him (okay I kinda liked that nod) I would have called Tatooine DSS. In the end, I think the luckiest person in this movie was Natalie Portman, because 1 - she barely did anything and 2 - she got to die. Okay that's a bit harsh, but really she looked like she didn't want to be there. She was a better actress than that. Hell, I bet all of them were better actors/actresses than George allowed them to be. So, did I like any of it? I did enjoy the "Order 66" scene. I did like seeing the Wookie planet...But did the Wookies' need to yelp like Tarzan when swinging from a vine? The answer to all of that is - of course they did. I'm glad I'm done with this trilogy. I'll probably never watch these movies ever again - at least on purpose - you never know when you're flipping channels and all of a sudden see Jar Jar Binks on your television. But as far as I'm concerned, I'm done and I can put this pain behind me - and think of the future, and a new hope that is right around the corner.